THOMASTON—On April 1, State Rep. John Piscopo (R-76) presented Darryl and Lucille Maslak of DLM Services LLC in Thomaston with a state citation from the General Assembly at Ciao Ristorante, 76 Watertown Rd. Rep. Piscopo and the Thomaston Economic Development Commission recognized Darryl and Lucille Maslak for their improvements to various properties throughout Thomaston and for their dedication to help bring new businesses to town. 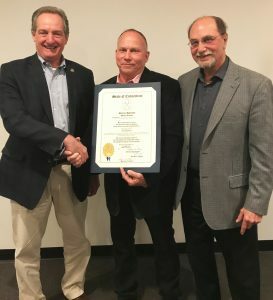 State Representative John Piscopo (R-76), Daryl Maslak of DLM Services LLC and Thomaston First Selectman Ed Mone on April 1, 2019 at an event honoring Darryl and Lucille Maslak of DLM Services LLC, which was held at Ciao Ristorante located at 76 Watertown Road in Thomaston. “Darryl and Lucille Maslak have been a positive driver for the economic development of Thomaston. This award is well-deserved,” said Ed Mone, Thomaston First Selectman.